Mac and cheese is like a vegetable in Georgia: no southern meal is complete without it. This classic staple is a fan-favorite at eateries throughout the state, especially when it’s homemade from scratch and oozing with cheesy goodness. You’ll want to devour every last bite at these 10 best places for mac and cheese in Georgia—don’t say we didn’t warn you. Their creamy mac and cheese features a blend of gouda and sharp cheddar cheese, and there’s never been a better combination. This amazing concoction can easily be a stand-alone dish, but there are tons of other delicious options to pair with it. Known for their relationships with local farmers and suppliers, there’s just no such thing as a bad meal here. If you’re looking to up your mac and cheese game, you’ll won’t want to pass up a meal here. Their broccoli bacon mac and cheese is crazy good, offering a unique twist on this tasty classic. And since it technically has broccoli in it, you can feel less guilty about the calorie-loaded carbs, right? 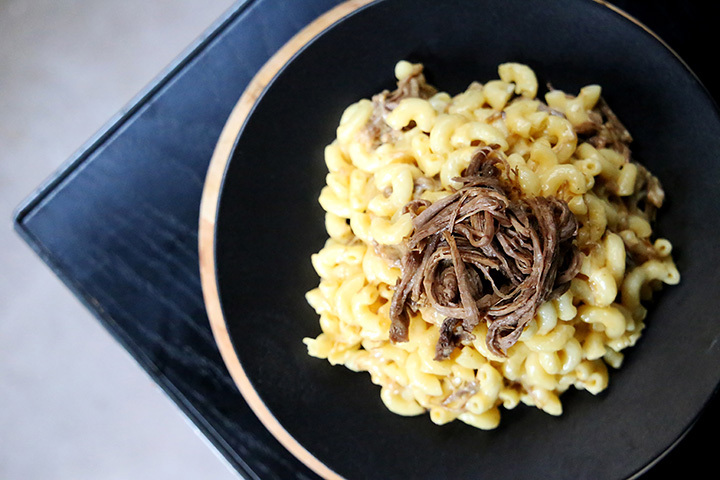 Tucked inside this old-school converted gas station, the mac and cheese and barbecue here are a match made in heaven. You can get their famous mac and cheese as a side or buy in in bulk for a family style meal. Either way, you can’t go wrong. The only thing better than the mac and cheese is the portion-to-price ratio. All their plates and sides are affordable for any budget, and you can rest assured you might run out of room before you run out of food. They also cater, so you can bring their mac and cheese to your next event and give your guests flavor they’ll remember. Their three-cheese mac and cheese might just make you want to skip the meat and make a feast of this mouthwatering side dish. Each of their three locations offers generous portions of their cheesy noodles, and you’ll want to lick the bowl clean might cross your mind. The “Bigg” in Bigg Daddy’s could mean a number of things, but they’re most likely referring to the major flavor packed into their mac and cheese. Smothered in smoked gouda, this stuff is surely a slice above the rest. The portion is big enough to be a meal, because mac and cheese it the south totally counts as dinner. Five words: Grilled. Mac. And. Cheese. Sandwich. This dish is game-changing, combining two American classics into a single meal. Talk about efficiency! Get their mac and cheese with any of the sandwiches or specialty plates and you’ll be totally satisfied. Pasta twists and cheese are served fresh and piping hot to give you flavor that tastes like it was made just for you. Not much has changed at Georgia Bob’s barbecue since they got their start in 1920, including their iconic mac and cheese recipe. They’ve always been focused on using family recipes that have been tested and proven throughout the years. Everything about their cheesy mac is spot on, from texture to taste to aroma, and you’ll want to savor every bite. Their lobster mac and cheese is the best in the state. Fans have been known to drive for an hour or more to have a bite. The gouda cheese makes it simply perfect.